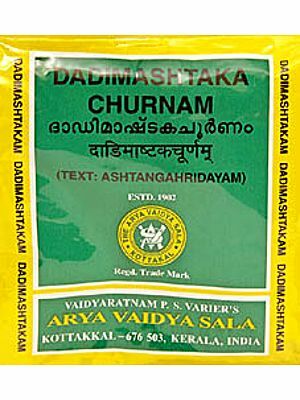 Churna means 'powder' in Sanskrit. In the category of Ayurvedic Medicines knows as 'Churna', powders of the whole plant or its various parts are used. The plant material is first dried in the sun and the dry substance is pounded in a mortar with a pestle and then filtered through linen. Ayurvedic Churnas may contain the powder of only a single herb, in which case they are known as Ekari Churna. When a combination of two or more herbs is used, it is known as Mishra Churna. These powders are not taken by themselves, but with a medium or vehicle of intake (Anupana), like honey, ghee or water etc. Honey, ghee etc. should be taken double the quantity of powder and water or milk etc four times in quantity.